These are pale, long-winged, long-legged owls, 33-39 cm in length with an 80-95 cm wingspan. They have an effortless wavering flight as they quarter pastures or similar hunting grounds. There are a number of races differing in underpart colour. For example, T. a. alba of western Europe is almost pure white below, but T.a. guttata of central Europe is orange. All races have grey and ochre upperparts. These are birds of open country such as farmland, preferentially hunting along the edges of woods. They are fairly sedentary and nocturnal or crepuscular. Barn Owls occur worldwide, on every continent except Antarctica. Sometimes they are called monkey-faced owls because of their appearance. Other common names are church owl, golden owl, rat owl, and stone owl. Barn Owls feed on voles, frogs and insects, but are economically valuable birds as they also prey on animal pests like rats, shrews, moles and mice. Other than human persecution, they have few predators, although large owls such as the Eurasian Eagle Owl and the Great Horned Owl will kill smaller species if the opportunity arises. 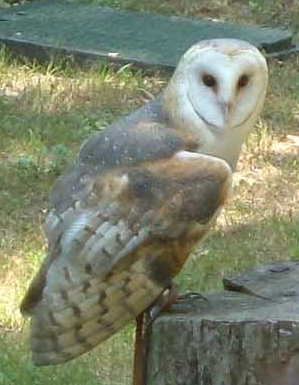 Farmers often encourage Barn Owl habitations for rodent control by providing nest sites such a wooden nest box or a large drum installed sideways in a barn. An adult Barn Owl will eat approximately 3 mice per day. A pair raising 3-5 owlets will consume many more rodents. Barn Owls have a notable shreee scream, ear-shattering at close range. They also hiss like steam kettles. When captured or cornered, they throw themselves on their backs and flail with sharp-taloned feet, an effective defence. Contrary to popular belief, they do not make the call "tu-whit to-whoo".